Early glider mail, Waschberg Mountain, plain buff cover franked 1922-24 100k, 200k and 300k, canc Wien/20/10/23 "Erste osterrriichissche/Segelflugwoche/ Waschberg bel Stockerau/13-21 Oktober 1923" machine cancel. 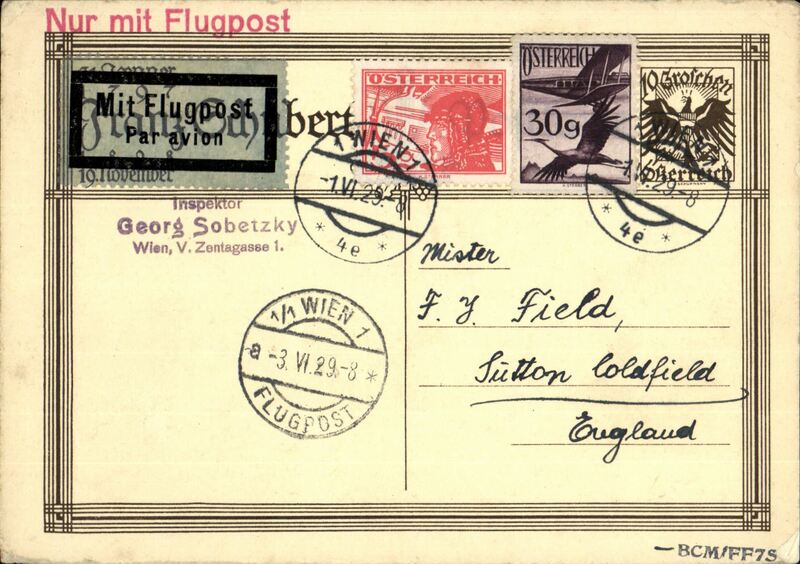 Early flown cover, Vienna-Philadelphia, USA, bs 2/7, uncommon diagonal red/white/blue stripe airmail cover, franked 1925 air 30g&50g canc Vienna Flugpost cds, scarce black/yellow etiquette. 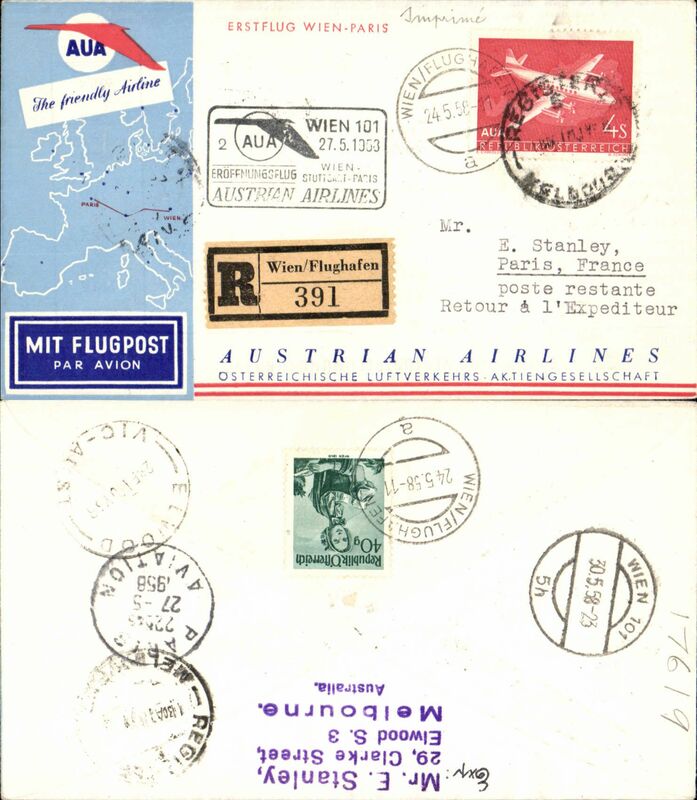 First daily service, Vienna to London, no arrival ds attractive 10G PSC with additional 5G an 30G addressed to Francis Field, England, red 'Nur Mit Flugpost' hs, black/pale green airmail etiquette, Vienna/Flugpost 3/6 transit cds. Francis Field authentication hs on front. 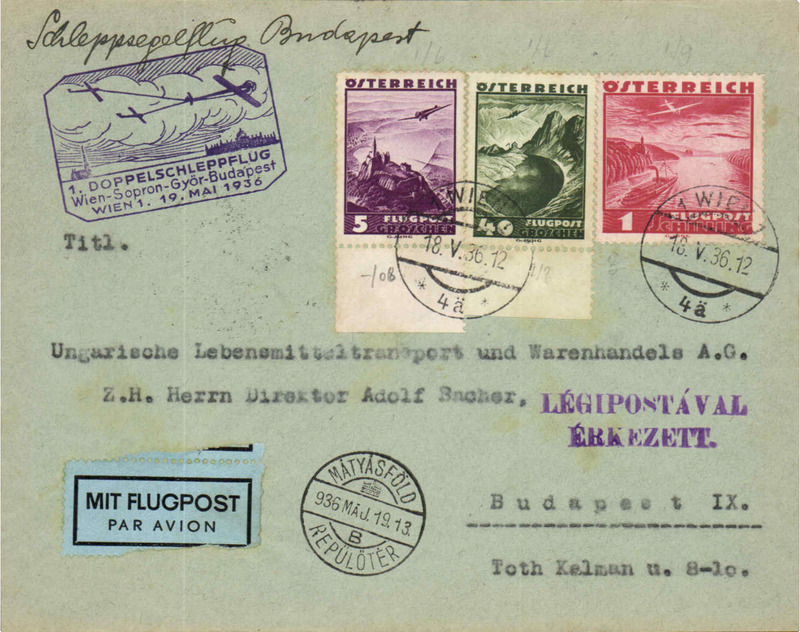 Oleag/CIDNA/Aeroput F/F Vienna-Graz, imprint etiquette airmail cover franked 1925 air 2g &30g, +1g, special depart cachet., black/blue etiquette. 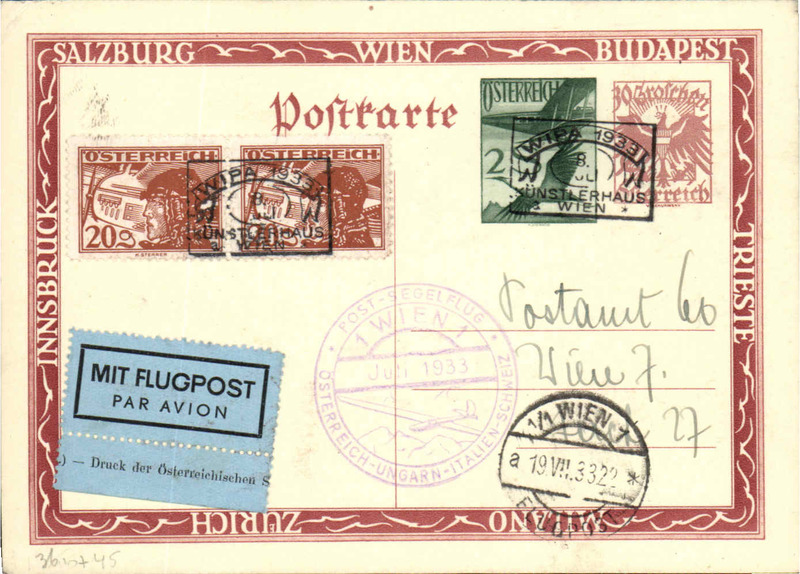 Oleag/CIDNA/Aeroput F/F Vienna-Graz, arrival ds on front, PC franked 1925 air 2gx2, 5g,6g,&10g, black/blue etiquette tied by special depart cachet. 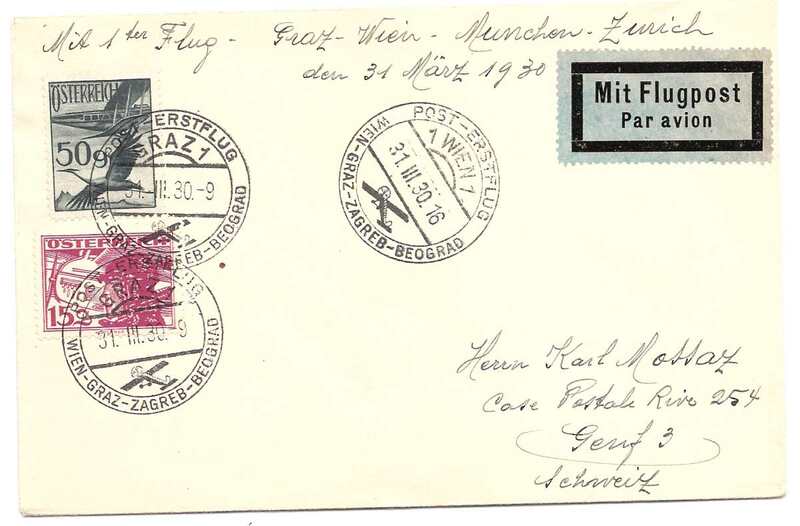 Oleag/CIDNA/Aeroput F/F Graz-Vienna, arrival ds on front, plain cover franked 1925 air 50g&15g, black/blue etiquette. 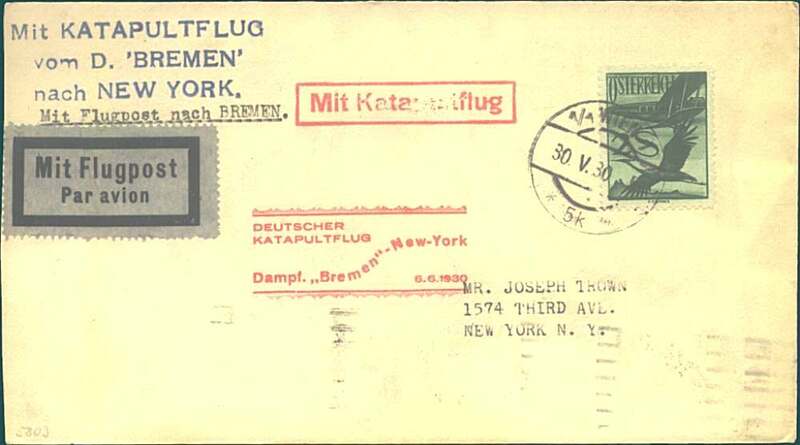 Austria acceptance German North Atlantic Catapult service, Vienna- New York, bs 6/6, franked 2S air, blue three line "Mit Katapultflug/vom D.Bremen/nsch New York" cachet, red “Deutscher Katapultflug/ D, Bremen/Southampton/6/6/1930" flight cachet and red “Mit Katapultflug" hs, black/blue grey etiquette. Flight K25 Graue and Leder. 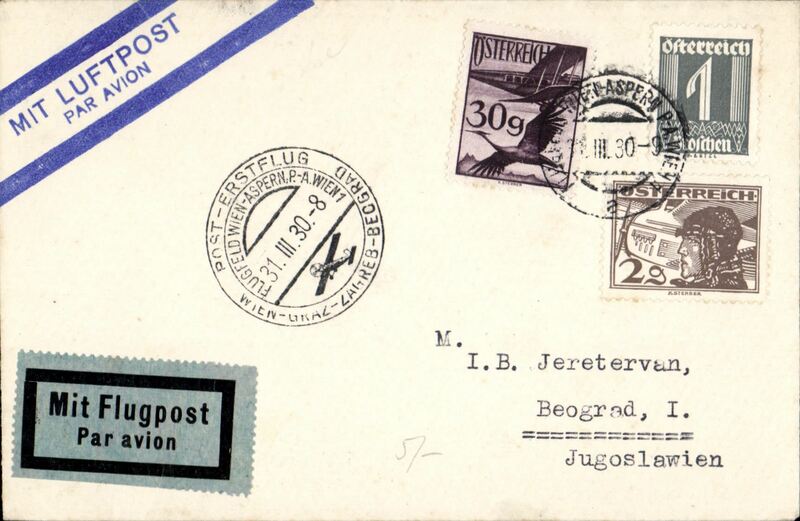 KLM, early flown cover Vienna-Batavia, NEI, bs 2/4, plain cover franked 1925 airs 20gx4,1S, canc Vienna Flugpost cds, black/blue etiquette. Uncommon destination. 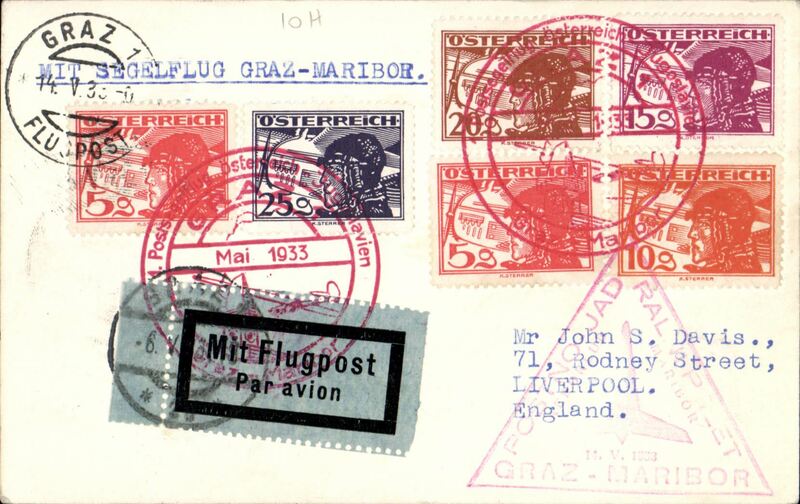 F/F Graz to Maribor glider, card franked 80g with 1926 airs to 25g canc Graz cds and fine strike red circular special cachet tying 1928 Mit Flugpost etiquette rated very scarce (Mair), also red triangular flight cachet, Image. 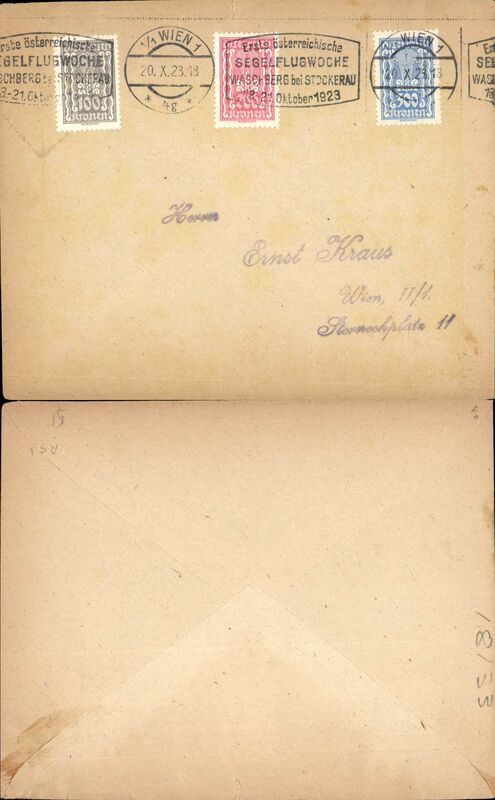 WIPA round trip glider flight, Vienna to Vienna, 19/7 arrival ds on front, 2S+30G light brown border PSC with additional 20gx2 1925 airs, tied special cancellation, violet commemorative cachet, blue/black etiquette, verso picture Kronfeld's glider over Stephan's Cathedral. WIPA glider flight, Vienna to Milan, 14/7 arrival ds on front, souvenir card franked 1925 air 30g&50gx3, tied special cancellation, violet commemorative cachet, blue/black etiquette, verso picture Lichtbildstelle, Austria. 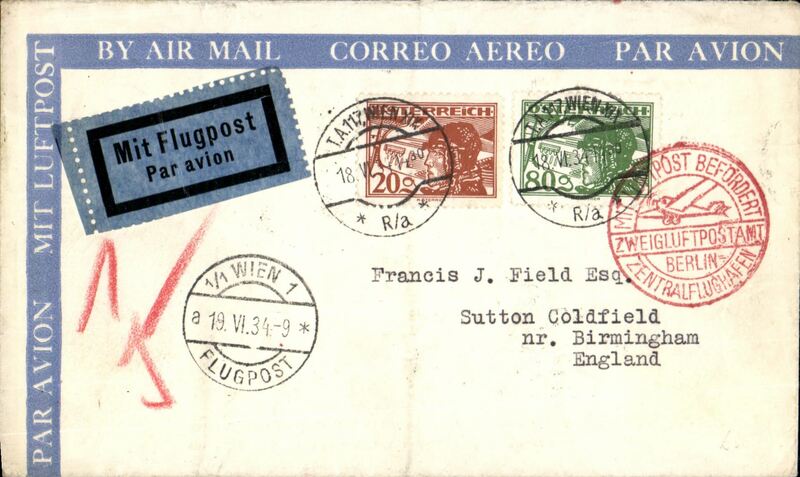 Vienna to London, via Berlin 19/6, attractive blue/cream airmail envelope franked 20g & 80g, canc - TA 117 Vienna 18/6 and tied by fine strike red Berlin/Zentralflughafen arrival hs, and Telegraphenamt Wien 18/6 verso. 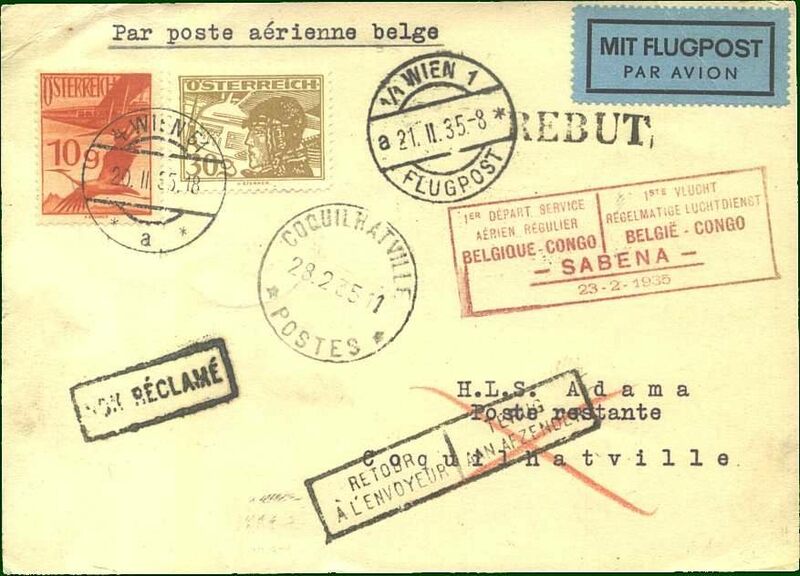 First acceptance for the Belgian Congo from Austria, Vienna to Coquilhatville, 28/2 arrival ds front and back, plain card carried on the first regular SABENA flight by the aircraft "Edmond Thieffrey" from Brussels to Leopoldville via Marseilles-Oran-Colomb Bechar-Reggan-Gao-Niamey-Zinder-Fort Lamy-Bangui-Coquilhatville, franked Austria 1925 air 10g & 30g, red framed bilingual French/Flemish F/F cachet. 26 flown. Glider Air Train, Vienna-Budapest, arrival ds on front and b/s, cachet, blue/black etiquette. 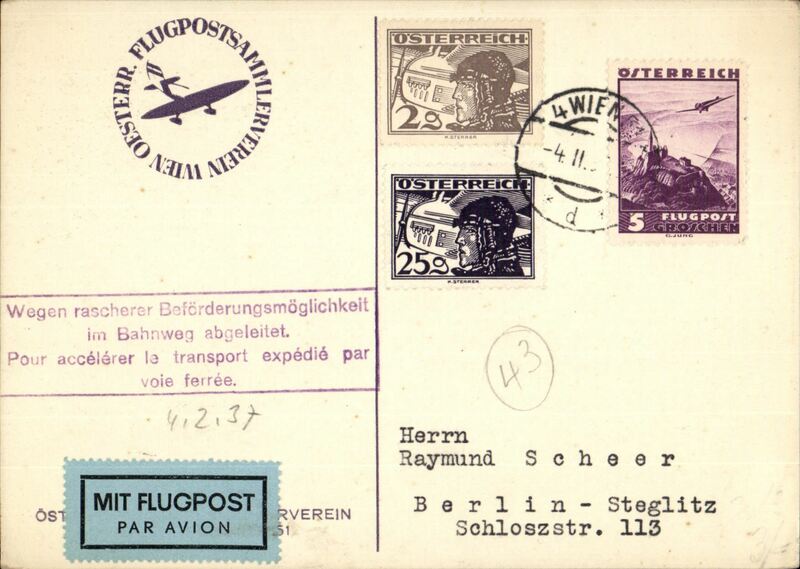 Vienna to Berlin acceleration by air, airmail etiquette PC franked 32g, bearing "Wegen rascherer Beforderungsmoglichkeit im Bahnweg abgeleitet/Pour accelerer le transport expedie par voie ferree"
WWII undercover airmail from Austria to Chile, Vienna to 'Casilla 2991, Santiago, bs 30/11, via New York 22/11, registered (label) franked 180pf canc Wien cds, airmail etiquette, sealed German censor tape tied by German censor mark. 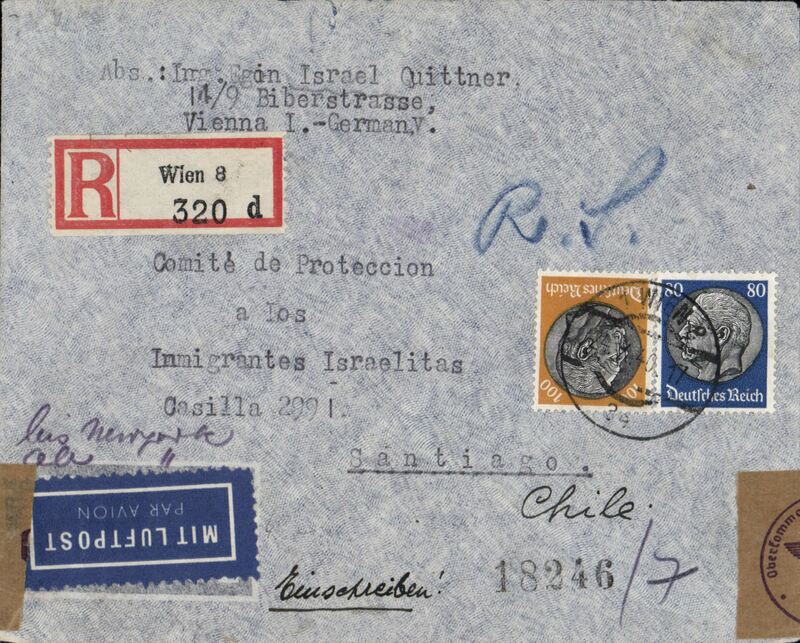 'Casilla 2991' was the undercover address of HICEM the organisation established in 1927 to help European Jews emigrate to South America. Image. 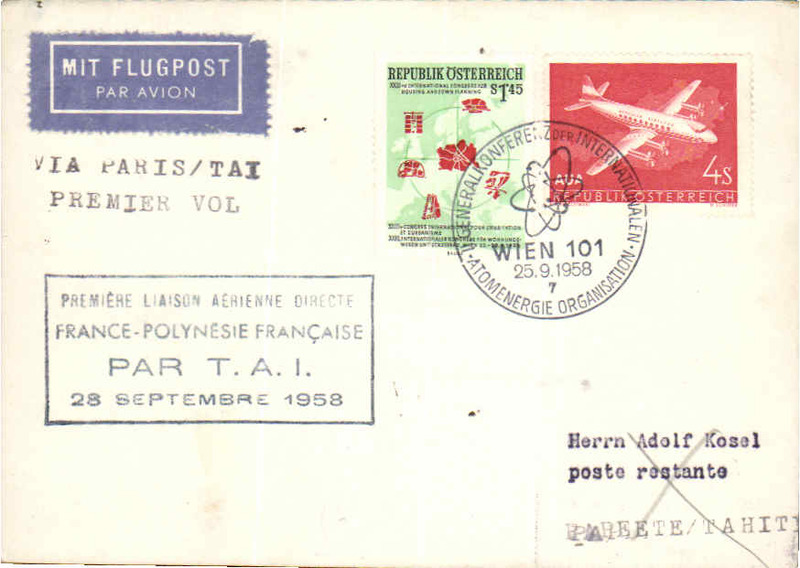 F/F "Mercure", Vienna to Paris, no arrival ds, pc franked 75g, canc Wien cds, red flight cachet..
Austria acceptance for first TAI direct flight Paris to Tahiti, bs 2/10, four line cachet, "Via Paris/TAI/Premier Vol" hs, franked 5.45S canc special Atomic Energy Conf. Ds. 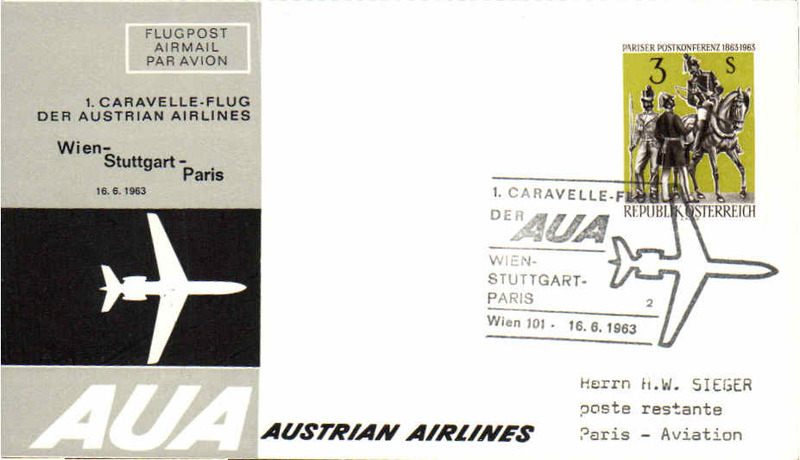 First Caravelle flight, Vienna to Paris, cachet, b/s, company cover, Austrian AL. 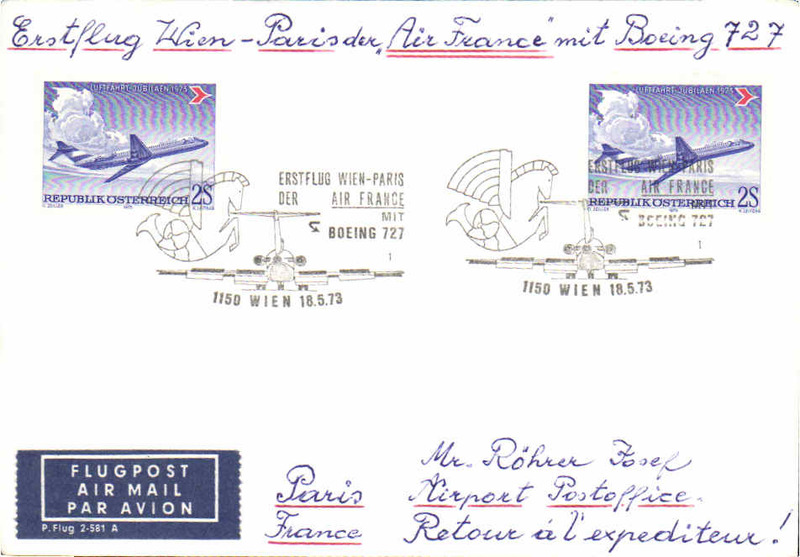 First B727, Vienna to Paris, b/s, special depart cachet, Air France.